Springs are tension meters and shock absorbers. Springs help keep a fence tight and they tell you how tight the fence wires are. Some people call them the "maintenance man" for the fence. Electric high tensile fences work better when the wires are kept tight and non-electric HT fences must be kept tight to work well at all. Long runs of high tensile wire have lots of natural springiness but change length more when the temperature changes a lot. Short runs have very little natural spring and will not "give much". Therefore, springs relieve thermal stress caused by big temperature changes in long runs and they relieve mechanical or physical stress caused by big or pushy livestock, fallen trees, etc., on shorter runs. The spring will give and then recover, most often without damage to the fence. Lighter weight electric high tensile fences with fewer posts and less bracing perform best and require less maintenance if they have a spring in every wire. Heavyweight HT fences with lots of wires, lots of posts, and plenty of bracing only need a spring in one wire of each section (traditionally second from the top) for measuring the tension by measuring the length of the spring. Then, the other wires are tensioned to "feel" like the one with the spring. MAX-FLEX springs are the ones with high tensile drawbars for extra strength. 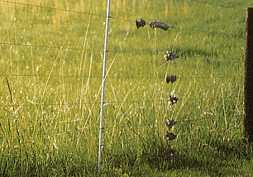 Other fence springs come apart when the hooks in the drawbars are straightened from horses or cattle rubbing fences, or collisions from animals like deer or bulls. MAX-FLEX springs are made from pre-galvanized wire so they are not softened by the heat of galvanizing after forming. MAX-FLEX springs have the most advanced wire coating available on the spring coils for the strongest and longest lasting fence springs. They are the best high tensile fence springs available. A220 Superlife Springs, heavy duty compression springs used for tension meters in all high tensile fences and for shock absorbers in most electric fences. MAX-FLEX springs have high tensile drawbars for extra strength and the most advanced wire coating available on the spring coils for the strongest and longest lasting fence springs. 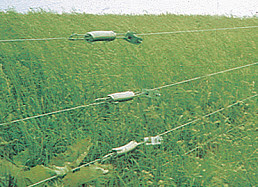 A300 Spring-Clip Tighteners, permanent in-line wire tighteners used with or without springs for maintaining wire tension for the life of the fence. The Spring-Clip Tightener does not require a special handle (17mm socket wrench is best). All parts are tested to high quality standards. The original Spring-Clip Tightener is not one of the "cheap" imitations and they are much more resistant to corrosion.